In October the Bukit Jalil Stadium outside of Kuala Lumpur is closing for six months. The entire pitch and its basis will be re-laid to provide proper quality for players. Sports Minister of Malaysia called its current state an embarrassment. TheStar.com.my report. 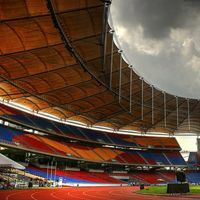 Bukit Jalil Stadium hosts the most prestigious international games of Malaysian national team, biggest domestic clashes and very popular foreign team exhibition games. Youth and Sports Minister Khairy Jamaluddin said that the field did not meet international standards and that, many both here and abroad, had complained about it. "It is time for us to do an overhaul or replace the field because I have seen it, and I've gotten a lot of feedback from local fans," he told reporters at a press conference on Thursday. This is why decision was made to close the stadium for as long as 6 months in October to redo the entire field of play. Khairy said that criteria and requirements for using the stadium would further be tightened. "I don't want to say that we're going to have an outright ban, but we're going to have a review on events like concerts and Government functions," he said.